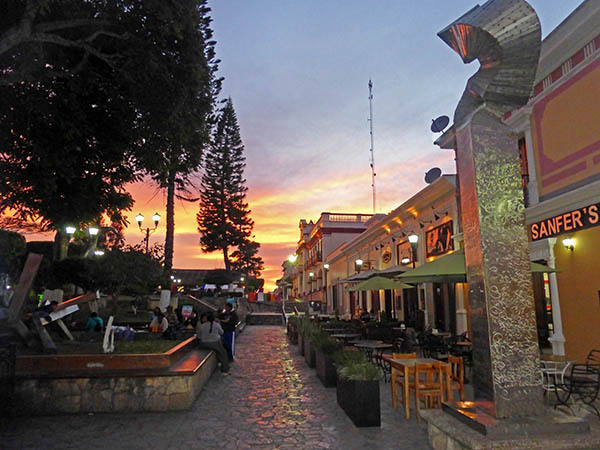 Fifty-six miles from the border with Guatemala lies the clean, family-focused tourist town of Comitan. 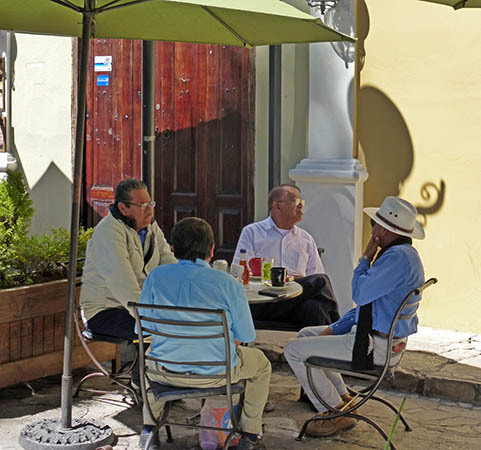 Most Gringos never come here, but rather journey on to the more famous and international city of San Cristobal de las Casas. 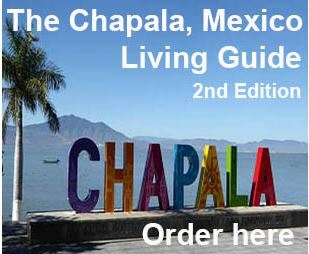 Very little English is spoken here in Comitan, but if you know some basics, you should definitely make a stop. 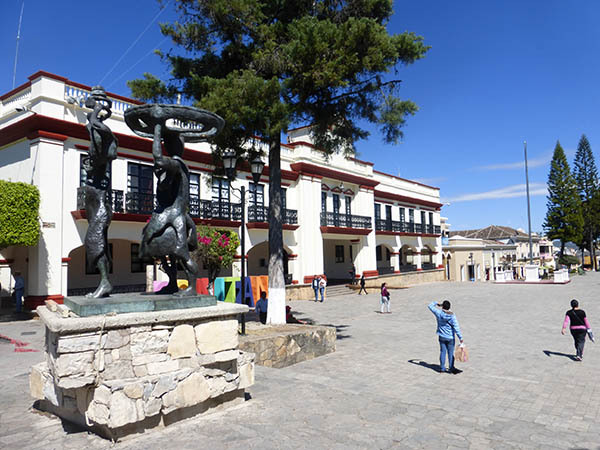 Launched in 2001, the Magical Villages Program sought to find villages in Mexico which had "magic" in its society and culture with great opportunities for tourism. The towns had to have symbolism, legends, history, important events and interesting day-to-day life which would appeal to tourists. 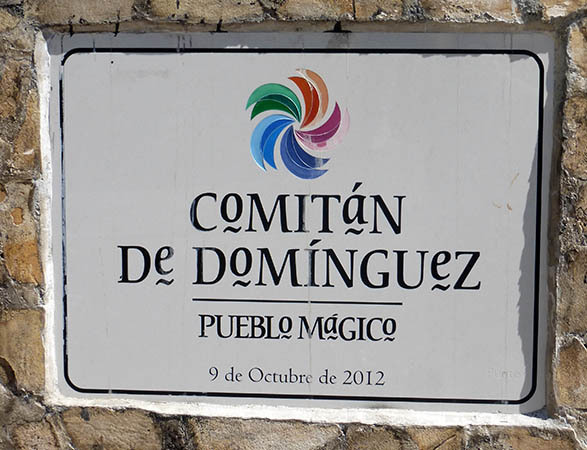 By 2012 a total of 83 towns and villages in all 31 States of Mexico had been awarded the title of Pueblo Magico, and Comitan is one of them! 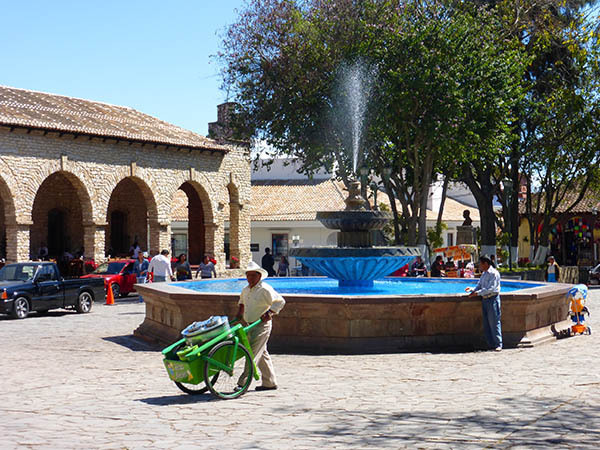 An ice cream vendor wheels his cart in front of the Plaza's fountain. People stroll about or sit in the shade on benches. Notice the beautifully laid stone surface of the Plaza and the gorgeous stone arches of the building on the left in the photo. One of Comitan's several banks is the white building on the corner of the Plaza, in the center of the photo. 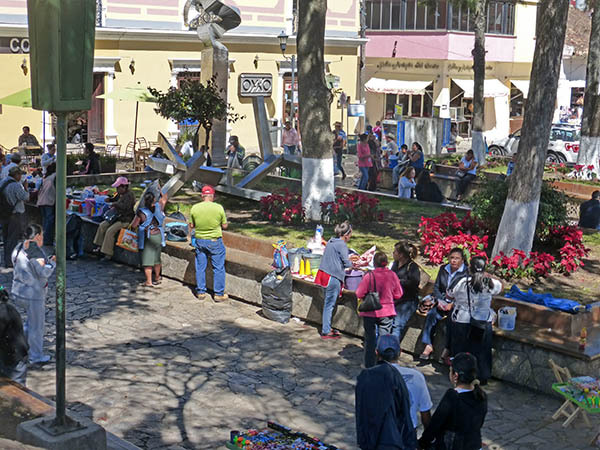 Most Plazas in Mexico are places where people gather to chat, eat, or shop. You can rest on the stone benches, grab a very affordable meal or a cappuccino in one of the restaurants and let your mind drift while you people-watch. The red flowers on the Plaza are nocha buenas or the poinsettia plant. We watched people gather every day to enjoy these corner style moveable restaurants. 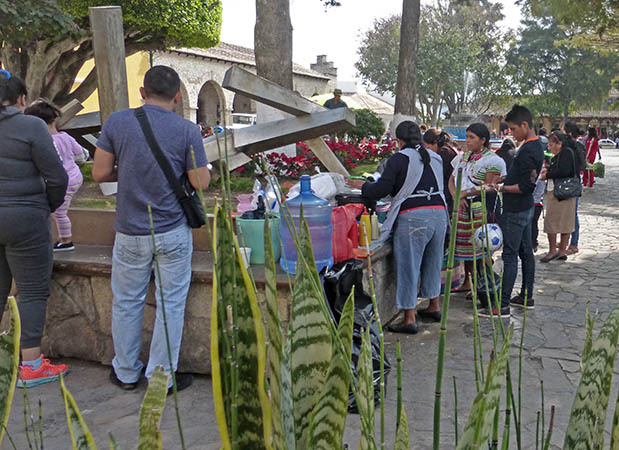 Food is prepared at home and brought to the Plaza to sell. Fresh water in the galafon (the large blue bottle) is for drinking alone or for making agua frescas, a fruit water drink that is very popular in Latin American countries. You can't really see the lunch special here in the photo, but every order was made of 4 small crispy tortillas, with refried beans, shredded cabbage, a dash of grated cheese and salsa. This plate of 4 sold for 10Pesos, or about $0.55 cents. It was definitely a favorite of the locals and they could have a fulfilling meal for very little money. Yes, I'm holding that table down so it doesn't blow away! 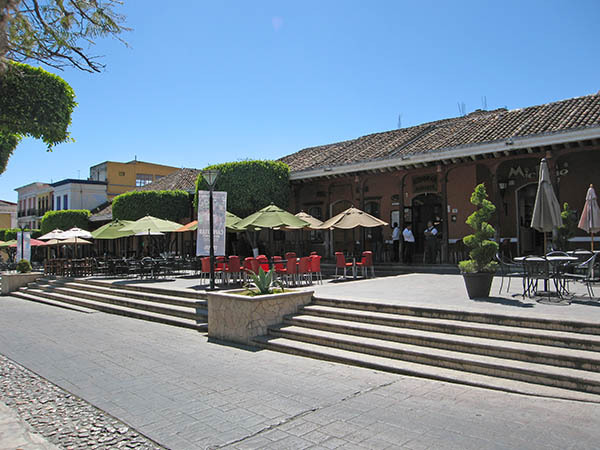 Our first days here we each sipped a cappuccino at 500 Noches, a restaurant/bar with indoor and outdoor seating. 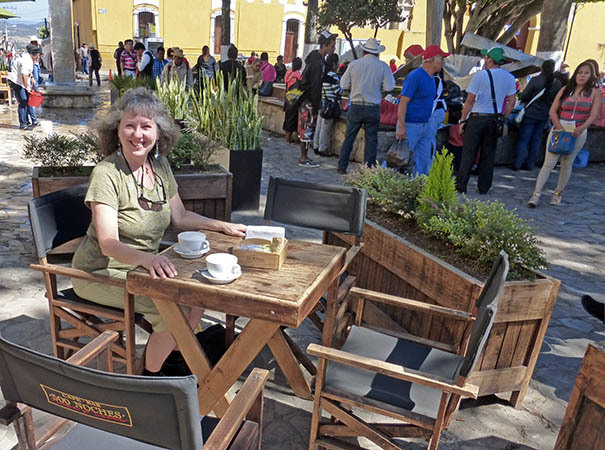 Cappuccinos were delicious and cost 50Pesos each, about $2.75 USD. Weather was gorgeous and we enjoyed the bustle of the Plaza. 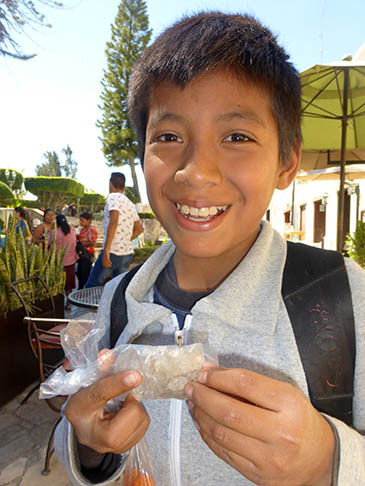 While savoring our coffees, this young boy came up to us holding 2 bags of "rocks." We asked him, "What kind of rocks?" "What are they used for?" This young boy from Costa Rica said "jewelry." Curious, I asked if these were crystals, and the 12 year old boy said, "No, just rocks." He said he was here alone, no family with him, and he kept looking skittishly over his shoulder. This made us nervous for him, not knowing the boy's full story or why he was here alone. Where was he staying? How was he eating? Who had befriended him and why? I said a silent prayer for his safety, and agreed to purchase one bag of rocks. 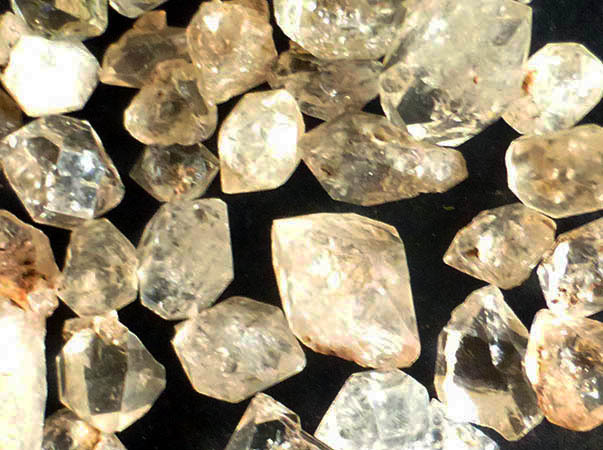 For 10 Mexican Pesos I bought 25 crystals with some of the dirt still on them. They were beautiful. After receiving our 10Pesos, he nearly ran away from our table. We do meet up with street kids from time to time and we wonder about how they live. I have no idea what I'll do with my bag of "rocks" but I love crystals. So maybe I'll give some to my grand niece and her friends, and keep a few for myself to enjoy their beauty. Several friends are having their morning coffees together, chatting about daily events. If you look to the left you will see the planter box that separates 500 Noches from Sanfer's coffee shop. Hereat Sanfer's you can get the same cappuccino for 30Pesos, about $1.65USD instead of 50Pesos right next door. The gardens on the Plaza are all manicured and well kept. Wrought iron benches and fencing decorate the area and are very pleasing to the eye. 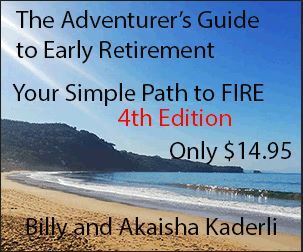 Tropical plants, palms and deciduous trees are all side by side. The white and maroon painted government building houses the offices of the government employees and the Mayor. 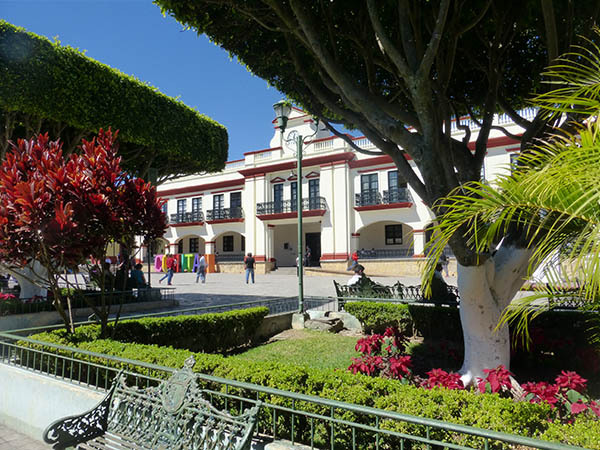 There is a courtyard inside along with bronze statues of political heroes and a beautiful mural depicting local history. 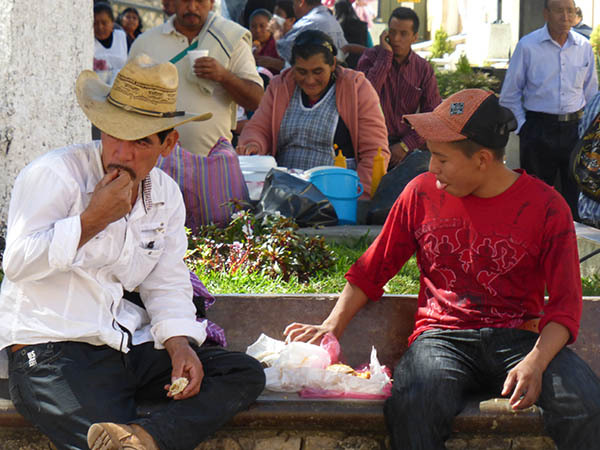 A couple of the things we appreciate about Comitan are its cleanliness and peacefulness. There's no trash strewn about, no graffiti, and people seem open and friendly. One day, while having some lunch at the Plaza, there was a political demonstration complete with microphones and the ripping down of banners from the opposing party. We know better than to get involved in anything such as this, and normally - had we not been sitting down at a restaurant, eating - we would have removed ourselves from the area. The political demonstration, for the most part, was peaceful, except for those who were ripping down signs and spraying graffiti on buildings. The beautiful, clean government building and the colorful COMITAN sign were covered in propaganda. "Death to Capitalism!" "Long live Communism!" 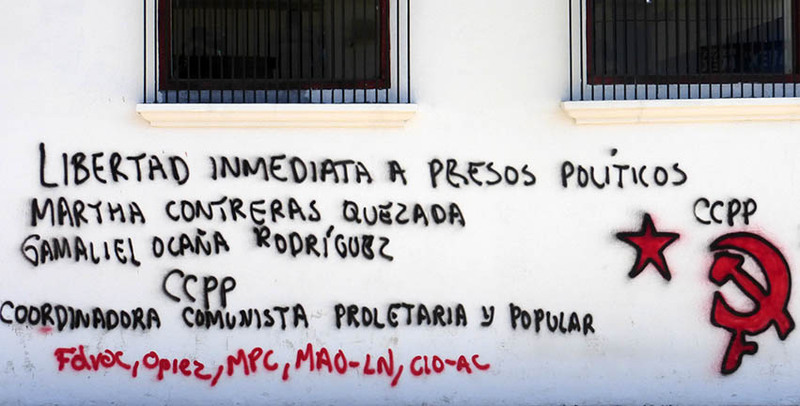 "We demand the immediate release of these prisoners!" Seeing the defacing of these gorgeous, well-maintained buildings made our hearts sink. We spoke with each other wondering how long it would take for the graffiti to be cleaned up. We have lived in cities and towns where there has been meeting after meeting, fund raisers, more meetings, and then months, perhaps a year later, something happens. We were happy to have taken photos of the Plaza before all the political mishaps. 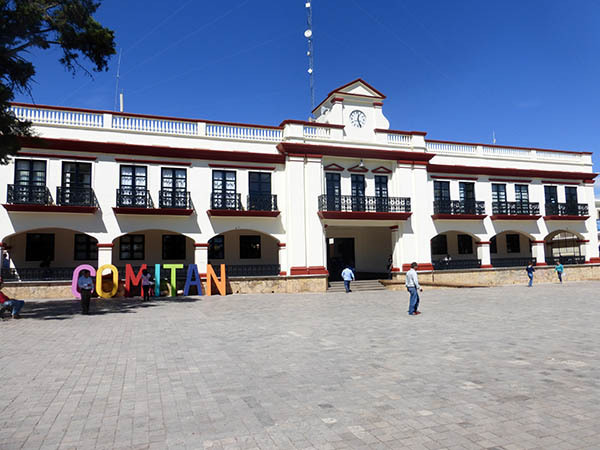 But the very next day, the government building, including the COMITAN sign had been painted over! No more graffiti! No meetings, no more additional meetings, no fund raising or permission to obtain funds -- just the clean up. The defacing was a non-event. We were stunned, joyful, and impressed! This is the area where we had been eating our lunch, and these are the banners that were ripped down. The paved street you see in the foreground of the photo is where the procession passed. Again, as you can see, the weather was incredibly beautiful. When we visited Comitan this time, the Mexican Peso was a little over 18 to $1USD. 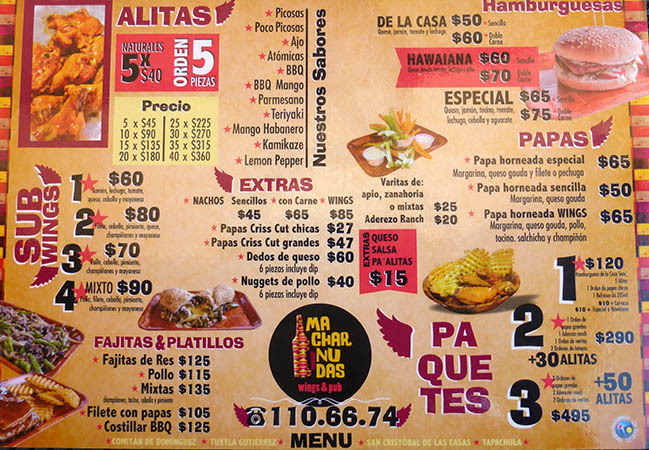 Here you see pricing is reasonable for meals and bar food snacks. The wings have 11 different sauces to choose from, including atomic, a little spicy, BBQ and teriyaki. 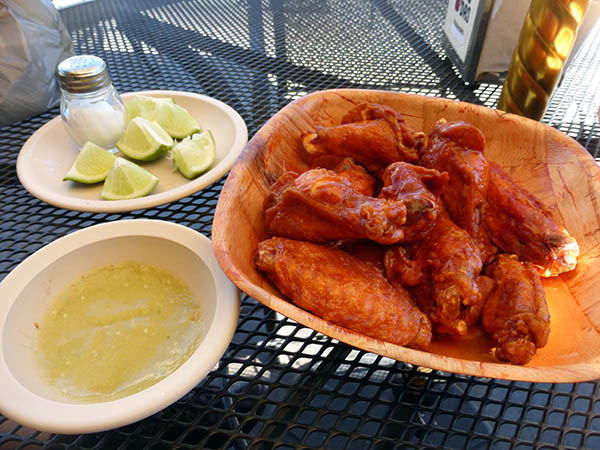 We chose wings that were "a little spicy" and they were some of the best wings ever!! We had a bowl of chips and here you see the green spicy salsa for them and the lime and salt is for the beer. 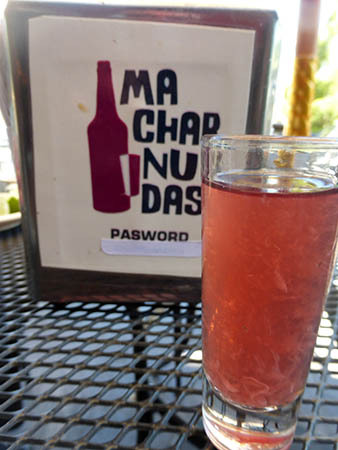 At one point we ask our waiter what the meaning of Macharnudas is, and he tells us to wait a moment. He comes back with two of these shot glasses filled with a pink, fruity, alcohol liquid. 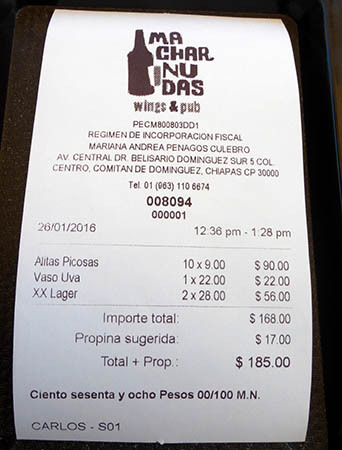 Here you see our bill with two orders of wings, a glass of grape juice, two beers and the tip is included. 185Pesos which is just over $10USD. On two sides of the Plaza there are restaurants with indoor and outdoor seating. One side of the Plaza has the church and the 4th side has stores, a theater, pharmacies and clinics. It's a very pleasant place to eat or have a coffee or beer. 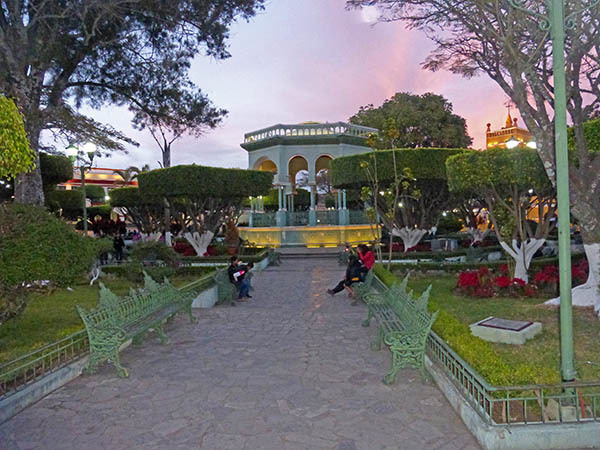 Every traditional Mexican Plaza has a church, a fountain and a gazebo. Here you see the beautiful gazebo of Comitan's Plaza. Stylized trees and plants, wrought iron benches, fences, and street lights all make for a relaxing, attractive place to sit and pass the time. The sun is beginning to set and the colors are coming out in the sky. 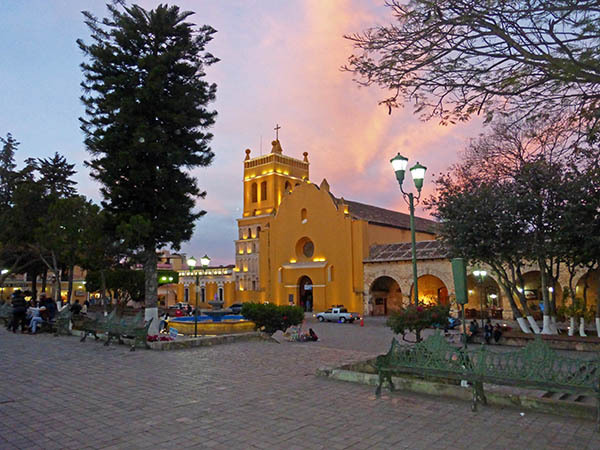 The Church makes a striking contrast to the sunset and dominates this side of the Plaza. Daytime at the Plaza is a whole different scene than what goes on at night. 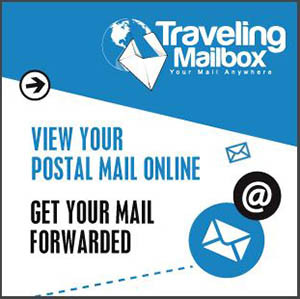 Live acoustic music plays from 500 Noches, or sometimes there will be a Marimba band and dancing. Night vendors set up along side neighboring streets and families come out to participate in the goings on. 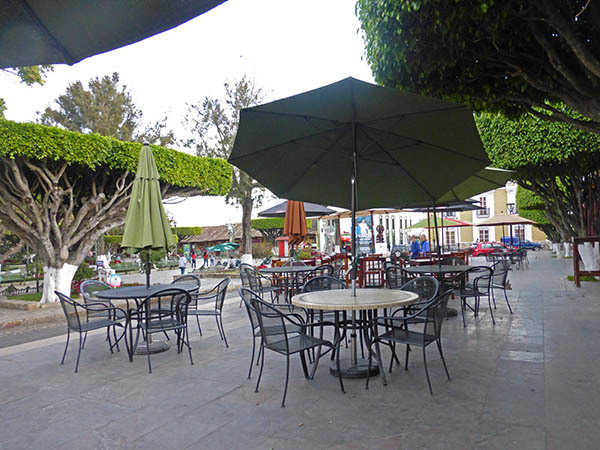 If you were to continue up this pathway further and outside the Plaza area, there is a nice large grocery store and further yet, is one of our favorite family restaurant/bars called Camino Secreto. If you ever get to Chiapas, Mexico, you must certainly stop by and visit Comitan.